The retreat seemed to me to be organised around creating the space for profoundly noticing and being inspired by the wonderful place we were in. 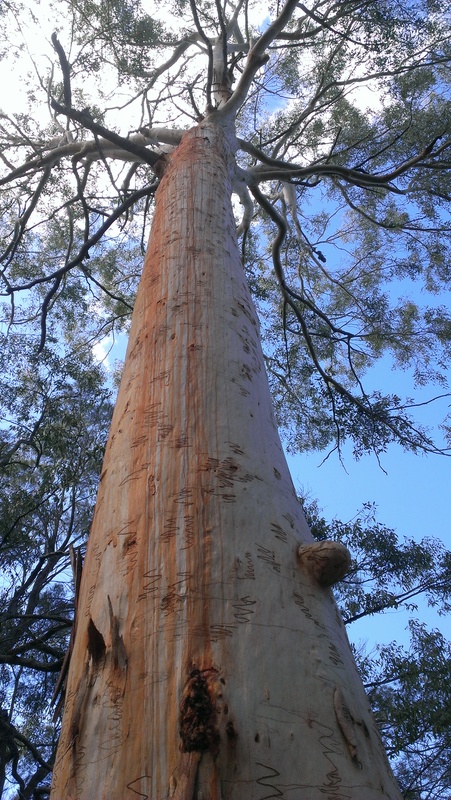 It was a homage to the natural world and to Tin Can Bay as a specific, special place. And what a place it is! 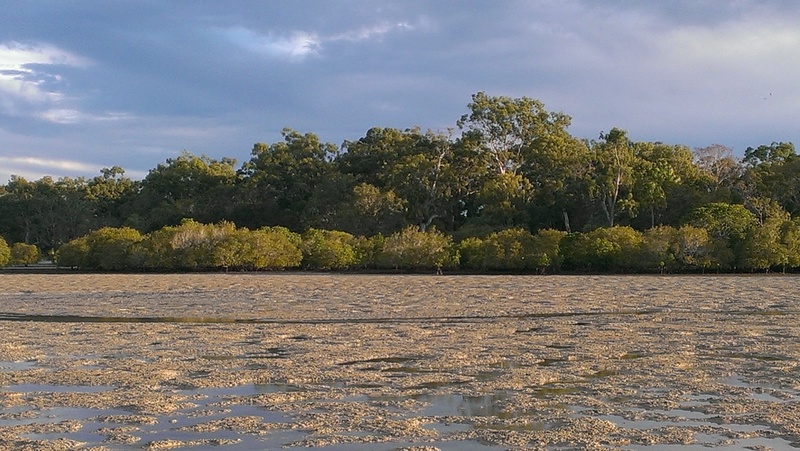 When we arrived, we first went out onto the mangrove mudflats. I love mangroves. They grow along the coast by Port Augusta, where I spent a lot of school holidays as a child, so for me they hold many happy memories as well as hours of experiencing mangroves. Being on them and among them, finding the shells and sea plants that get trapped in their branches and roots as the tide recedes, peeling their seeds and even burying treasure in a biscuit tin beneath a particularly special tree. These did not seem exactly like the mangroves I played among as a child. 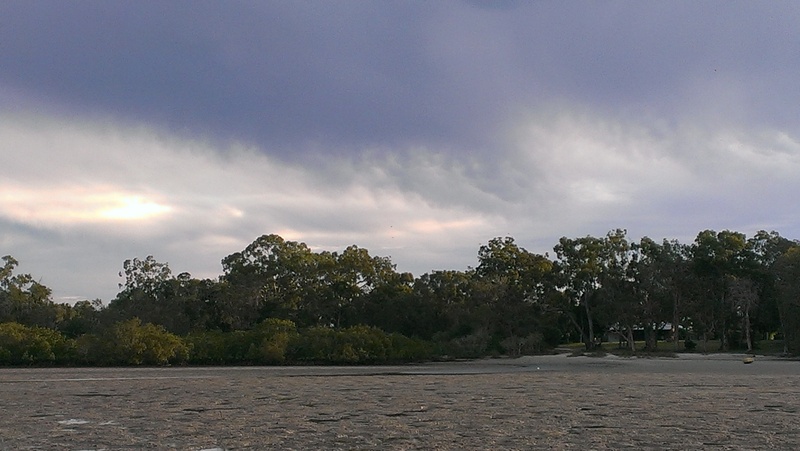 I realised at Tin Can Bay that I had somehow imagined all mangroves were sisters. But it seems that they might be cousins. There is an extended family of mangroves. There were many different invitations to go out into the scrub or the mud flats or the paperbarks with a small set of creative constraints or a little imaginative task. Invitations to focus closely on the wonderment that is nature, and the mangrove flats and the Wallum in particular: to be with and among it, to be inspired by it. I was fascinated by this process. It seemed as though others had encountered it before–but many of my companions have had training as artists and I have not. I was in awe of others’ skills and imagination. I love being out in the world as an ardent admirer. Queensland is a tropical, fecund, damp place by comparison with the place where I live, which is dry and bare by comparison. 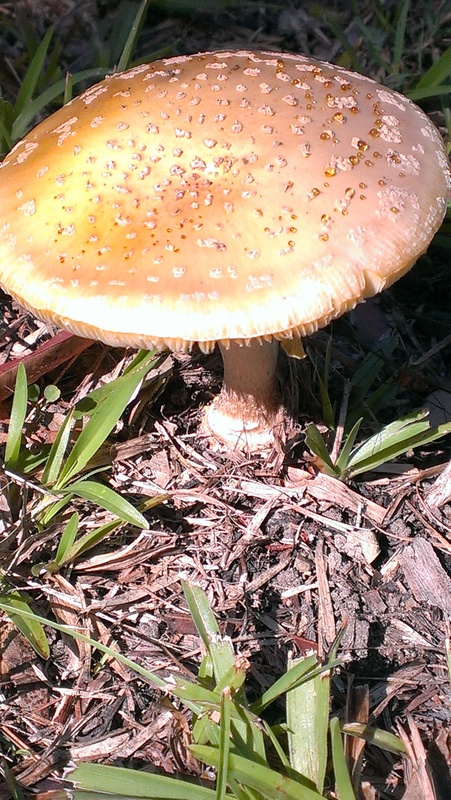 Here, fungi were everywhere. 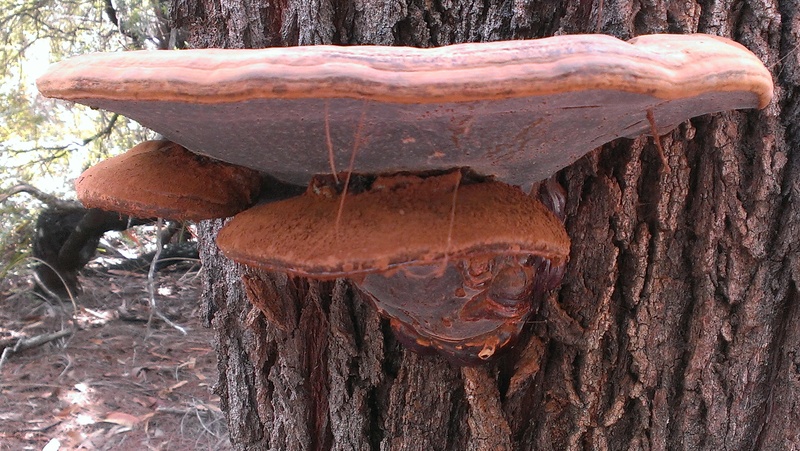 In all states of growing and decomposition. Springing up in all kinds of shapes and places. Apparently from every kind of direction. The variety of texture was amazing. 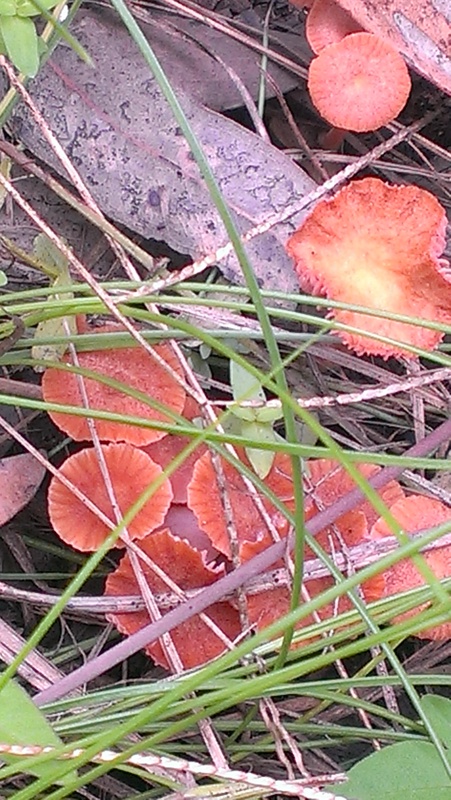 There were flocking fungi and solitary fungi. I took many out of focus pictures of orchids and butterflies and spiders but mostly I just gazed in awe and marvelled at sharing a planet with such wonders. 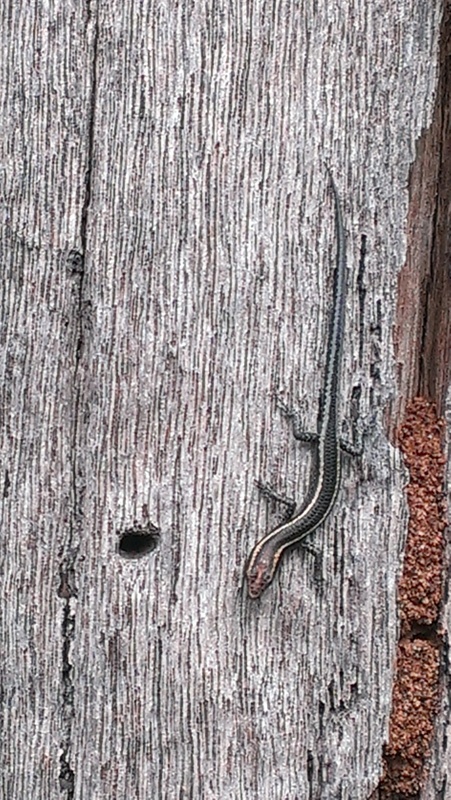 I found this skink basking one afternoon. 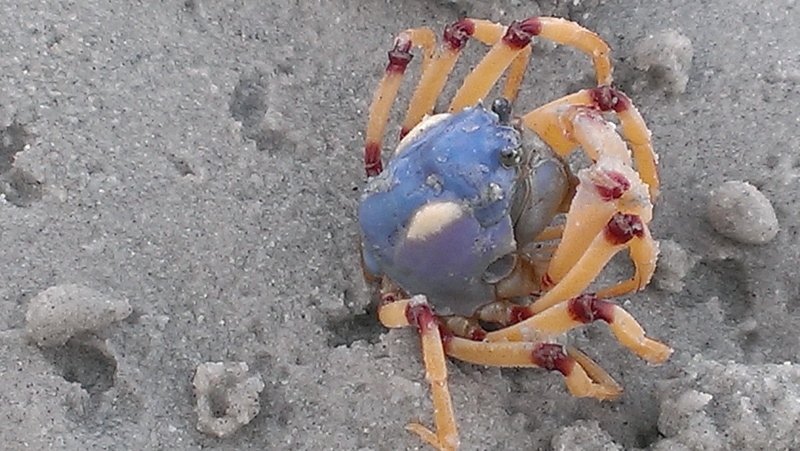 I was amazed by soldier crabs. I have not manipulated the colours at all. They really are blue, with burgundy elbows and knees! These creatures can vanish under the sand and pull the back door closed behind themselves in a very short span of time. There were many small wonders. 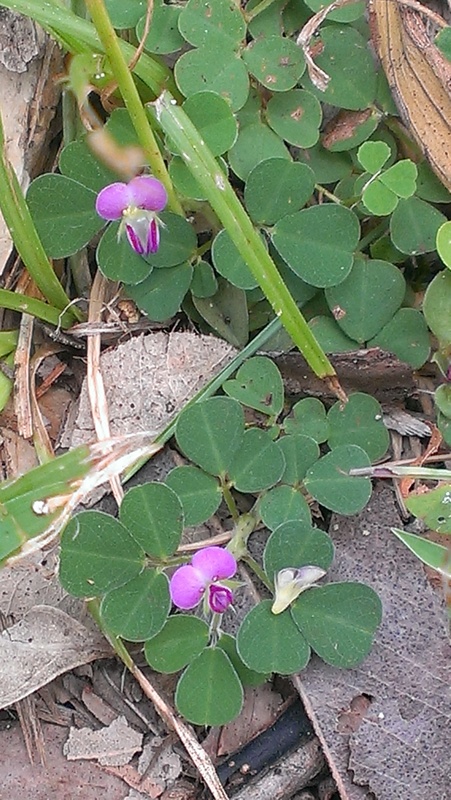 There were tiny orchids and tiny plants and tiny flowers. Because this isn’t my part of the world, I couldn’t always tell weed from wild plant. This could be a problem in other contexts, but it was quite pleasant to have awareness of environmental devastation slightly further from the centre of my focus awhile. 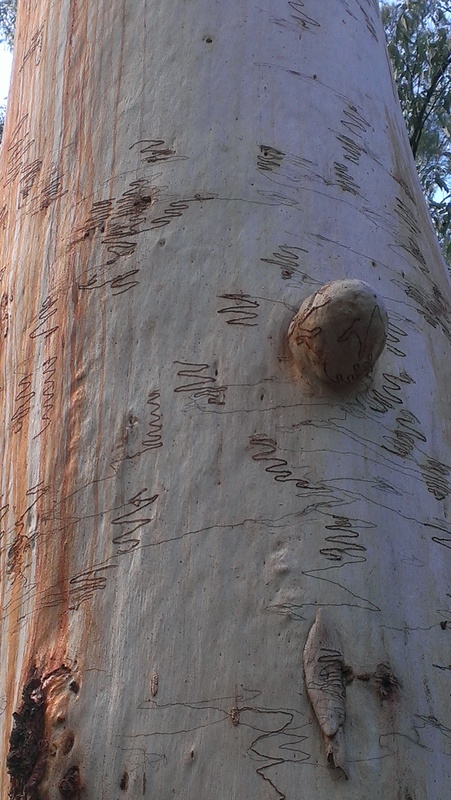 India says these are Eucalyptus signata–which is wonderfully poetic in itself, to my ear. Banksias… tree sized banksias! I am growing prostrate banksias and the coast in my state is home to shrub sized or low growing banksias. They are lovely. These were immense. Even the shrubby banksias were blessed with wonderfully large leaves. It did have me in mind of May Gibbs’ banksia men, despite my adult critique of them as caricatures of a questionable sort. 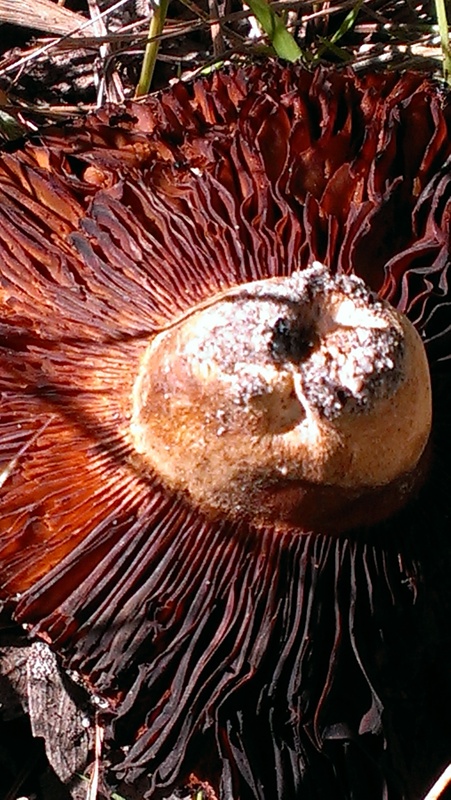 Non-Australians and maybe even younger Australians should know I am referring to a book by Australian writer and illustrator May Gibbs called Snugglepot and Cuddlepie, in which the banksia men are inevitably villains–there are no banksia women. I will let you draw your own conclusions about Australian attitudes to hirsute and dark skinned men, particularly in the period in which she was writing–the early 1900s. If you’re curious, google images will show you what I am talking about with a few keystrokes. Her illustrations entranced me as a child. 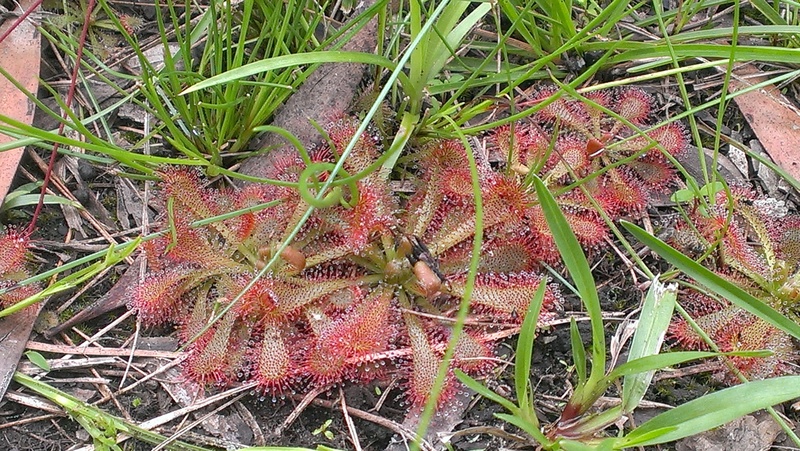 There was another workshop participant who squeaked in glee at sundews–so it wasn’t just me! Insectivorous plants–some even in flower. Wonderful. Roz and India offered all manner of paths into considering how we might be inspired by nature, including videos by artists speaking about or simply showing how they work. There was the wonderful example of these two artists themselves speaking about their own ways of working and showing some of what they do and think. And there was poetry and writing as another pathway into how other imaginations might think the natural world and our relationship to it. Simply wonderful. It certainly did inspire creativity in all its diversity. But as always this close focus on the natural world inspired in me, first and foremost, awe. That you ‘love being out in the world as an ardent admirer’ is clearly evident in your words and very much in your photos! … its lovely to be able to share in your adventures, even if only briefly and in the minds eye…. 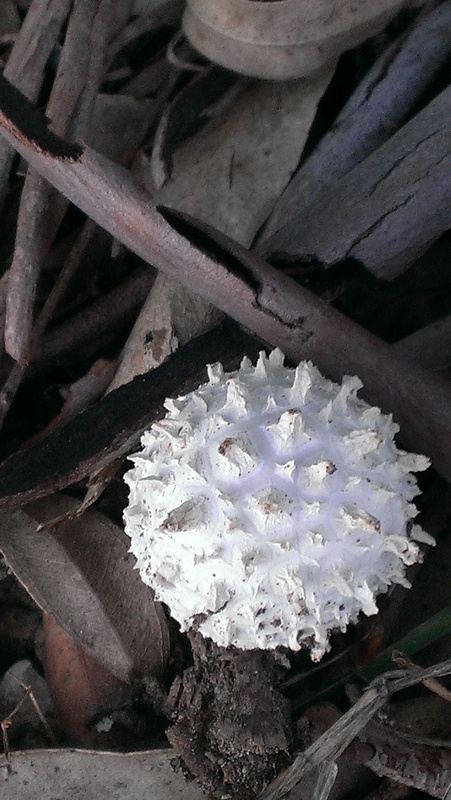 What wonders…the banksia (? 2nd from bottom) is so funny…it looks like nothing so much as a whole crowd of talking monkey mouths! 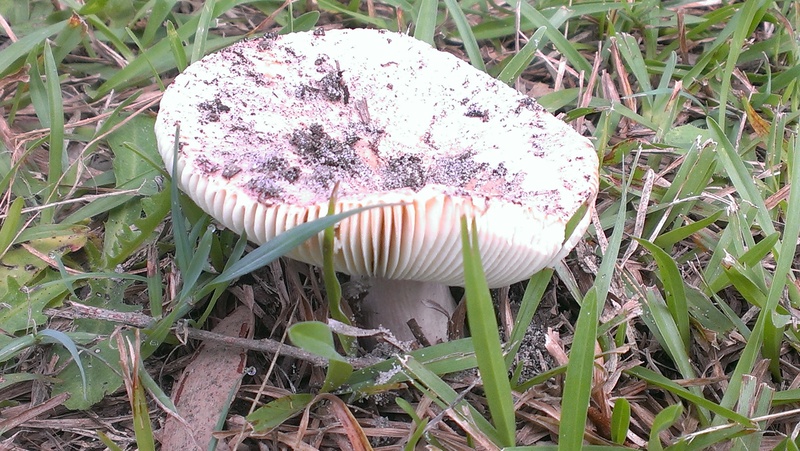 With all the various fungi, did you do any dying or spore-printing with them? How did Tin Can Bay get it’s name? You’re welcome! 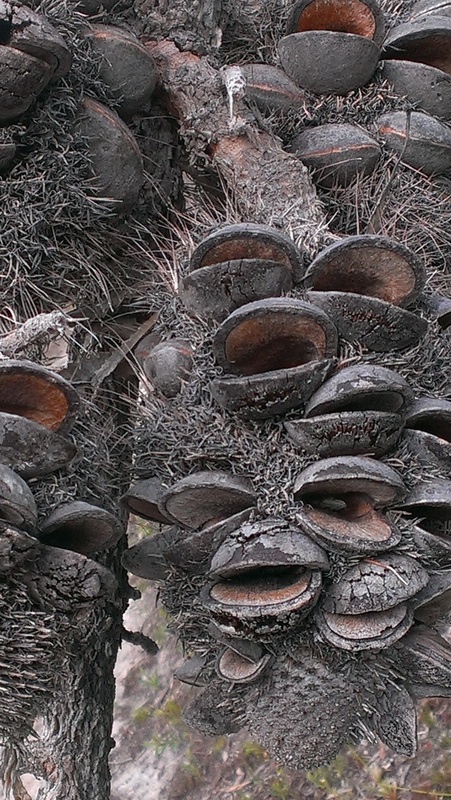 The ‘monkey mouths’ are part of the banksia–after the compound flowers die back on the cone or cylinder shaped flower heads, these are the fruiting bodies–the way those ‘lips’ have come apart has released the seeds inside. It seems ‘Tin Can Bay’ draws on the Indigenous name for the dugong. If that isn’t an overwhelming example of something wonderful and Indigenous being transformed into something prosaic and trivial through anglicisation, I don’t know what would! More information here. How wonderful to learn about dugong, a member of the same species as manatees. 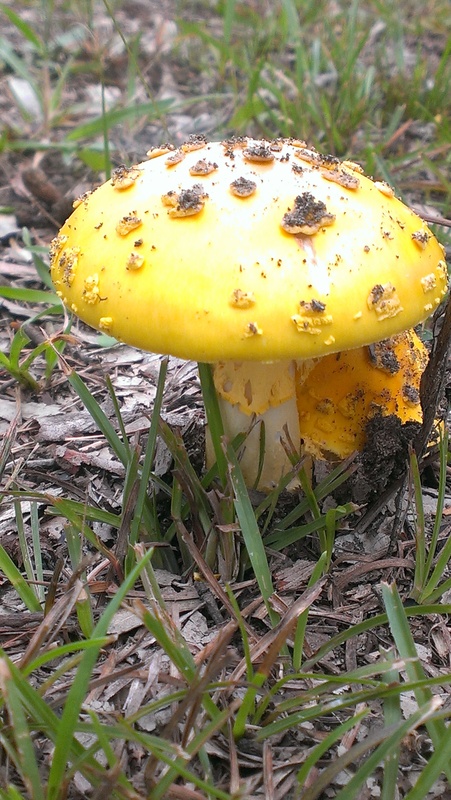 I have sometimes seen them when visiting Florida. They seem to be the epitome of placid gentleness (which is probably their downfall). Lots of people see dugong in exactly this way. I have never seen one in the flesh. Glad you have! You have such a lovely turn of phrase & an individual perspective that is completely engaging. Very fun to read these posts from half way ’round the world and to see all the wonders over yon! gosh, Mary, what kind words, had no idea – Thank You for that, I’m very appreciative. Wow. This is all sorts of marvelous. Mangrove sisters (and cousins) and crabs and looking at plants for what they are rather than where they should be. So many interesting and wonderful things! Beautiful photographs. I really enjoyed the years I lived in Queensland such tropical wonderment. I loved the lizard life, soldier crabs and of course the world’s largest flying mammals, the flying foxes.